We've just returned from two weeks in Texas and Louisiana visiting family and Lexie had a ball as usual. She simply LOVES her cousins as well as her Grandma (or Gamme as she's calling her this week) Aunt Boo-Boo, Uncle Jim-Jim and Aunt Yin-Yin. The silly double name thing started when my nephew Cody as a baby couldn't say Aunt Lou Ann (surprise!) so he called me U-U and it stuck. Naturally everyone else had to have their own special double name. I even managed to get a picture with Lexie & BooBoo together. It doesn't seem to happen often. Anyway, it was a pretty low key visit as my sister Angie (aka Aunt BooBoo) is 7 months pregnant with twins. That's right there will be more cousins for Lexie to play with very soon. In the mean time, you can see she has a kindred spirit in her cousin Princess Mackenzie! Have you ever seen two more adorable princesses? Of course her cousin Cody is a very special Prince. He even found her glass slipper and placed it on her foot. Naturally it fit! And here is her littlest cousin Blake. They had a ball together - when they weren't disagreeing over whose ball it was - haha. He's 2 1/2 and we were in his house so it was a little tough for both of them. Overall though they did just great. This was one of their sweet moments together. Thanks Z. Here is one of the moments she shared with her Gamme. They had a end of school block party the day after we arrived so Lexie got to mix it up with all the kids in the neighborhood. They got the bouncy house out that I gave them years ago and turned it into a water slide. Those Texans sure know how to put on a little get together. The spread was amazing and well worth the heat and bugs. Did I mention it was REALLY hot and humid and the bugs were bigger than my hand? So of course we had to do a little swimming in their pool since Lexie thinks she can swim now. For Lexie it was all about the look!! We brought her puppets which were a huge hit. They were so cute putting on their shows. Of course I videoed each one but I won't bore you with them. But you can take my word for it - they were Tony winners!! Cody & Mackenzie had great report cards for the year so I got them the latest Wii game. And here they are "sharing" with the little kids. Funny thing is Blake & Lexie don't know this is a game that only 2 can play. Their controllers aren't turned on. What they don't know can't hurt them - right? And you can't tell from this picture but they actually were having fun. Then we were off to ITZ to celebrate their great school year and Lexie's 4th birthday. Yes the family wanted to celebrate her birthday too and who am I to say no! even an indoor mini-roller coaster that Lexie proudly road by herself so Z could ride with Blakie. This one Z play was a jump roping one. Really fun! They even have a free section for the younger kids with bouncy houses and a little train and plane and all kinds of things for them to do. Then Z took the kids for a spin in a big rig. Lexie was shifting gears and Blakie was on the horn. One of the cooler things was this machine where you can "ride" 6 different roller coasters and the laid back seats move with the show. I had to drag them off after 4 rides. Of course the evening had to end with them turning in their tickets to get some kind of prize. Whenever we go we've always put all the tickets together and divided it by the number of kids. I am pleased to say we didn't come home with some blow up Dora or even a crown. Lexie had enough to get this lovely parasol. Way better than most of the stuff I've thrown away, I mean, that she's won. Then we actually had her 4th and final 4th Birthday party - this one being the family party. Going to ITZ was the party and then we had cake and presents the following day. The rule is you are suppose to have a party for every year they are celebrating - right? Someone please tell me if that's not true since her 16th birthday could go on for months! Everyone was more than generous as usual and Lexie was thrilled with everything she got. Thank goodness mom had an extra suitcase I could bring home and will bring it back with me when we return for the birth of the twins - filled with stuff of them. Blakie was obsessed with the cake. He just keep saying "cake - cake - cake" while Lexie was opening her gifts. The mischievous little guy! Mom picked up these party favors while we where in Kaz 3 years ago. She had enough foresight to think it would be nice to have something from Kazakhstan to celebrate at Lexie's birthdays. Way to go Mom! One of the gifts I had suggested was a doctors kit since Lexie is still playing doctor all the time at home. Well Angie & Mom went one step further and got her the full outfit. Needless to say Lexie had to put it on immediately and get to work. Here is Princess Doctor Lexie Lou working on her first patient of the day - Cody Bear. What a trooper! Sadly the patient needs surgery so Princess Doctor Lexie Lou has suited up and is ready to go in. So it's official. Lexie has turned 4 and will not have another birthday party.....until next year! One of the few things I requested we do while in Texas was to head to the beach. Well Wed there was a tornado warning in our area so we waited until Friday when the weather would calm down and Jim-Jim would be home. Galveston beach was still feeling the effects as you can see by the waves. The water was very muddy and there was so much sea weed on the beaches there were bulldozers pushing the piles of sea weed off the beaches. But none of that stopped Lexie from working her outfit! We decided if you can't beat them then join them so instead of a sand castle we made a mud fort complete with sea weed on top for decoration. Thanks Mackenzie. but I'm not sure how much good it did rinsing off in that muddy water. And BTW, there was no oil in these water. The spill is further east by Louisiana. Here was the end results. The waves didn't beat us even if the mud actually won! So that was our low key visit at Angie & Jim's house in Texas. The last 4 days were spent at my sister Lynn's house in Louisiana just across the lake from New Orleans on her horse farm.We went last year and Lexie got to have her first lesson with Yin-Yin so she was very excited to head back. I never did post the pictures from last year so I'm going to stop now and do a whole horse farm post later. I promises Lynn & Broke you will have your own post. In the mean time here is a little teaser. Yes she was a princess even on the horse! I can't end this post without noting that three years ago today the judge of Court #2 in Aktau Kazakhstan gave a "positive decision" to allow me to adopt Alexis Falen Quast. 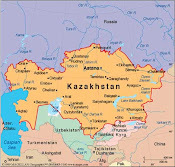 I had to wait another 14 days for the final decision but as anyone who has adopted in Kazakhstan knows, getting through court (and my day in court was anything but a formality as I was told it would be) and getting a positive decision is a big milestone in the whole adoption process. God works in mysterious ways to create families and our family is proof of that. I thank God every day for the beautiful baby girl He gave me to raise.